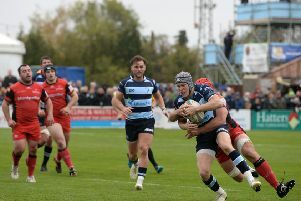 Bedford Blues tasted Greene King IPA Championship defeat for a second time this season as they went down 14-9 to Jersey on Saturday, but left the island with their heads held high after an improved performance. In challenging conditions, the Blues started brightly and were awarded an early penalty but Myles Dorrian’s effort drifted to the right of the uprights. Bedford’s persistence paid off and another penalty went their way in the ninth minute when Jersey wheeled the scrum as Elliot Clements-Hill slotted between the posts. The greasy ball was tough to keep hold of and Jersey benefited immediately when a knock on was caught in an offside position as Joe Buckle went over to make it 5-3. Dorrian kicked a penalty in the 13th minutes, before Cope replied with one of their own as both sides were then a man down as Josh Buggea and Nick Haining were sin-binned. Jersey converted a 30th minute penalty to increase the lead to 11-6 but Bedford were close to levelling before half time through Hayden Thompson-Stringer and Clements-Hill. The second period was an attritional affair with both teams cancelling one another out as they attacked. Cope’s kicking boots failed him as he hit the post and then dragged another wide. Bedford continued to try and find a way through the Reds back line and the scrum was starting to cause Jersey all sorts of problems with Dave Spelman, Jacob Fields and Thompson-Stringer doing the damage before Chris Judge, George Edgson and Jack Culverhouse continued the good work. Speaking to the club’s official website, Ben Adams said: “The score doesn’t show the mammoth effort that went into the game. Blues host London Irish this weekend.